Discover how to take stunning portraits with this amazing resource from one of the world's top photography sites. Do you want to take Portraits with the WOW Factor? Whether it's taking pictures of our friends, kids, partners or even ourselves - people are what we're looking at through the viewfinder (or on the LCD) when we line up a shot. Yet so many of us struggle to take portraits with the 'WOW Factor'. 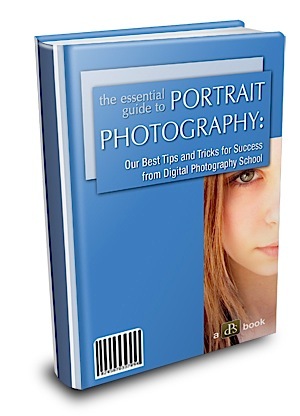 We wanted to help you achieve your true potential as a portrait photographer, so we’ve released a comprehensive 78 page downloadable e-book (this is not a hard cover book - it is a PDF e-book) to teach you the secrets of stunning portraiture. The Essential Guide to Portrait Photography is brimming with portrait photography advice, tips and imagery. It's a collection of some of our best previously publish tutorials which have been updated for this edition - plus some new previously unpublished content. Here's a screen shot to show you a little of the layout. This is a pretty typical page - images to illustrate what's being taught but no padding - just loads of quality teaching. The main section The Essential Guide to Portrait Photography are largely theory. While the teaching is solid and we believe you'll get a lot out of it - we've also put together a further 17 pages of interviews with some great portrait photographers. Grab a copy of this great new ebook here. 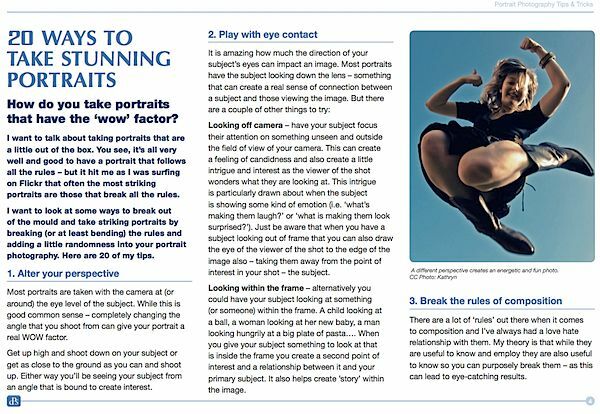 If you’re not satisfied that The Essential Guide to Portrait Photography ebook is helping your photography within 30 days just let me know and I’ll refund your money – that’s how confident I am that this is a resource that will help you improve your portrait photography. 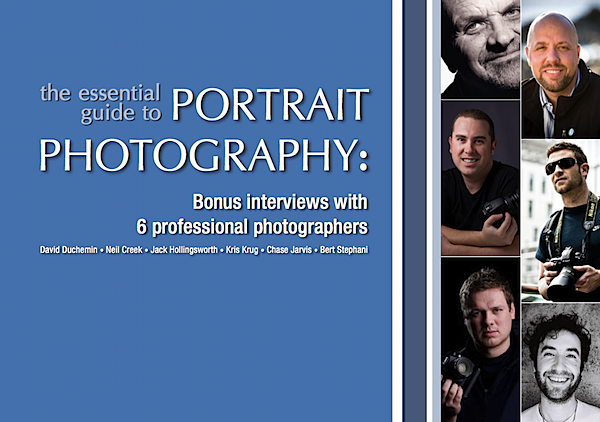 Why Invest in The Essential Guide to Portrait Photography? 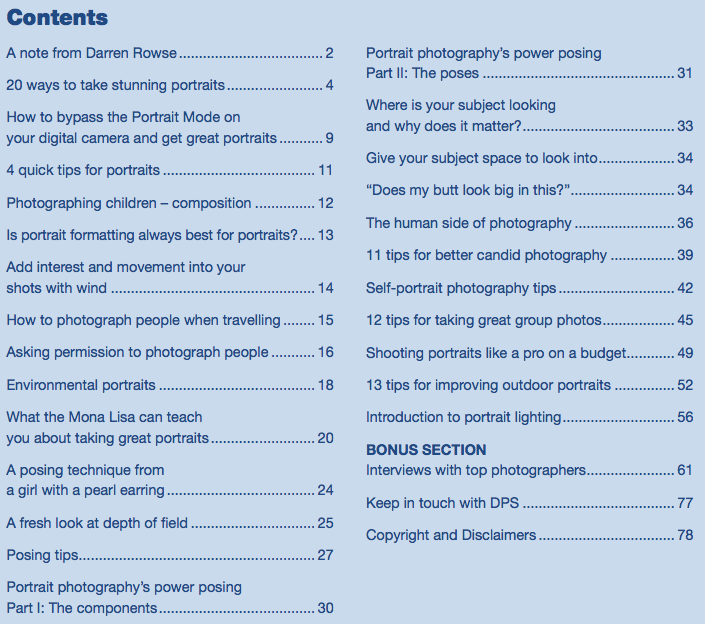 Because it contains our very best portrait photography tips on 25 topics - all in the one easy to read book. Because you get it immediately - there's no delivery fee because it is a downloadable ebook. This cost of this e-book is $19.95 USD. Join thousands of others in grabbing a copy here with a Payment is via PayPal or Credit Card. 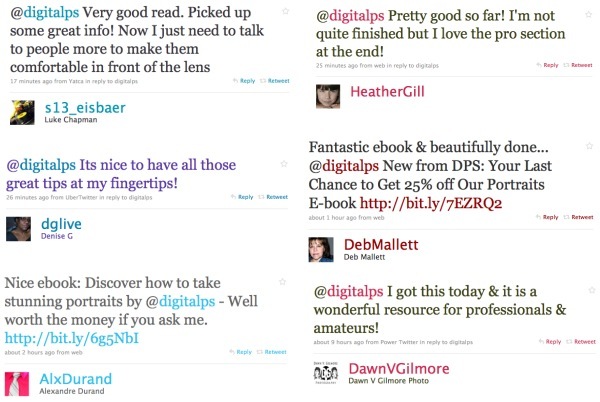 There's been a lot of buzz around about this e-book - here's a few more tweets from those who've bought it. Having trouble with the shopping cart? Click here.